Back in the era before Bluetooth, smartphones and mp3s, a stereo system was judged by the size of its speakers. These days, we prefer our music portable and without the hassle of cables and clunky knobs and buttons. GAYOT’s Top 10 Portable Wireless Speakers highlight the best Bluetooth listening devices. 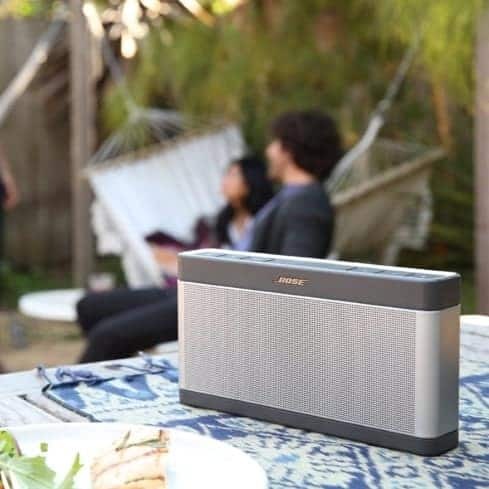 Whether you’re at the park, by the pool or enjoying an evening around a campfire, these compact yet capable mobile sound systems make it easy to take your tunes with you wherever you go. They also make a great gift, so be sure to check out our full list of gift guides for more ideas. Take Bose’s world-famous audio technology on the road with the SoundLink Bluetooth Speaker III. The compact device features classic Bose clarity and full-spectrum sound in a sleek and slim package that allows you to easily transport it in a tote bag or backpack. Personalize your speaker with an optional soft cover, available in a variety of colors. Get the party started with the UE BOOM 2! This stylish cylindrical speaker boasts 360-degree sound so all your friends can get into the groove. The colorful plasma skin is both water and stain resistant, meaning you can enjoy your music in the pool, on the ski slopes or at the beach. One speaker won’t cut it? Crank things up a notch with the UE BOOM app, which allows you to wirelessly link units in rich, stereo sound. Boasting a rugged yet handsome water-proof design, JBL Charge 3 is an ideal choice for indoor get-togethers, weekend pool parties or a day at the lake. 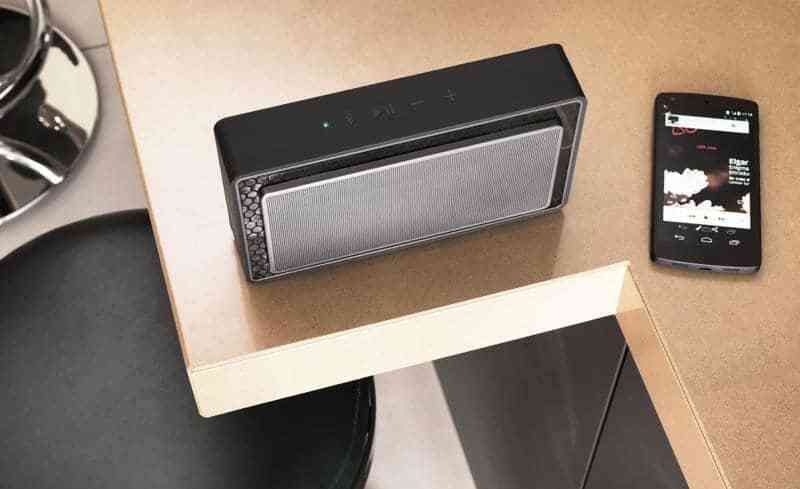 We love that the speaker wirelessly connects up to three smartphones or tablets to give a true stereo sound. You can also receive phone calls with ease thanks to the noise- and echo-canceling speakerphone. Powered by an energy-efficient lithium-ion battery, JBL Charge 3 offers an impressive 20 hours of playtime so you can spend more time having fun and less time recharging your device. The smallest in Bowers & Wilkins line of bespoke high-fidelity speakers, the T7 packs a potent sonic punch. Fitted with powerful twin bass radiators and audiophile-quality digital-to-analog converters, this advanced speaker provides a clean and balanced sound at any volume — and boasts a surprising amount of bass. Bowers & Wilkins uses advanced Bluetooth aptX technology, which allows for high-resolution streaming and crystal-clear playback. 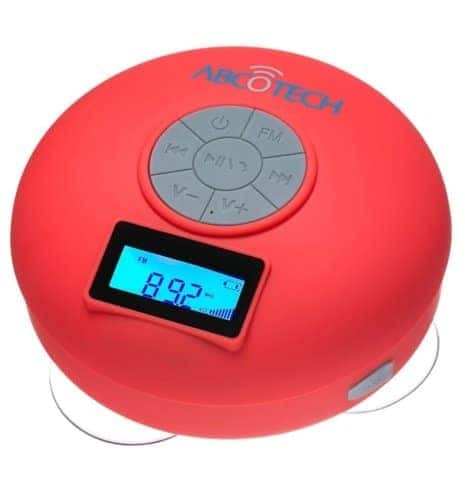 ABCO Tech’s portable water-resistant speaker was built with budget-conscious music lovers in mind. The shower speaker easily pairs with any Bluetooth-capable device and offers a hands-free speaker phone with built-in mic for calls. The durable, water-resistant casing and suction cups ensure a worry-free experience while you’re listening in the shower. Plus, the built-in FM radio comes in handy when those smartphone playlists start to get a little too long and repetitive.